The field of electric and hybrid systems engineering is a young and emerging one. At New Eagle, our team is proud to support the research and educational institutions that help develop both the next generation of technology in this field and the next generation of engineers. Wisconsin Hybrid’s converted vehicle runs on clean, green electric power. New Eagle’s sponsorship of the University of Wisconsin-Madison (UWM)’s hybrid electric vehicle engineering team, Wisconsin Hybrid, is just one of the ways we honor our corporate commitment to our foundational values of charity and excellence while supporting our vision of building a better world through efficient technology. 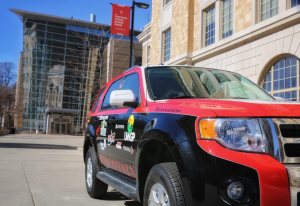 Wisconsin Hybrid modifies stock vehicles with innovative new technology to improve vehicle efficiency and demonstrate the application of advanced electric powertrains. They have been awarded five national championships and four runner-up titles in the Advanced Vehicle Technology Championship series. 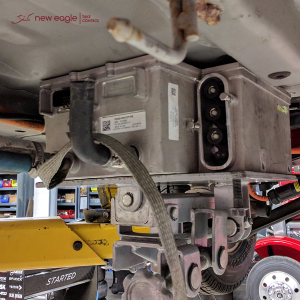 A New Eagle inverter helps Wisconsin Hybrid’s EV run efficiently and safely. One of their most recent projects involves converting a 2009 Ford Escape into a two-mode electric vehicle capable of all-wheel drive operation for off-road driving and two-wheel drive operation that maximizes on-road efficiency. New Eagle supplies key hardware components that help the team accomplish projects like this, and also serves as a financial supporter of the team. We are proud to help Wisconsin Hybrid drive innovation in the EV field while furthering the education of young engineers.